Scripture tells us that we comfort others with the comfort we ourselves have received (2 Corinthians 1:3–5). To the degree that we are healed and comforted, we can offer those same gifts much more freely to others. Emotional Freedom Techniques, EFT, is a God-created physiological technique that allows us to experience liberty and choice about our feelings and how we experience them. It involves tapping gently on acupressure points of the face and upper body. This tapping can release pent up emotional stress, via the neurological system, of daily and long-term events and memories. Hundreds of university research projects now show why EFT works so well in releasing various traumas, including anxiousness, fears, and persistent sadness. Learn how to experience emotional freedom by tapping into God's peace and joy today! I had a great time with Dr. Jim Richards at his annual Heart Physics conference in Huntsville, Alabama. 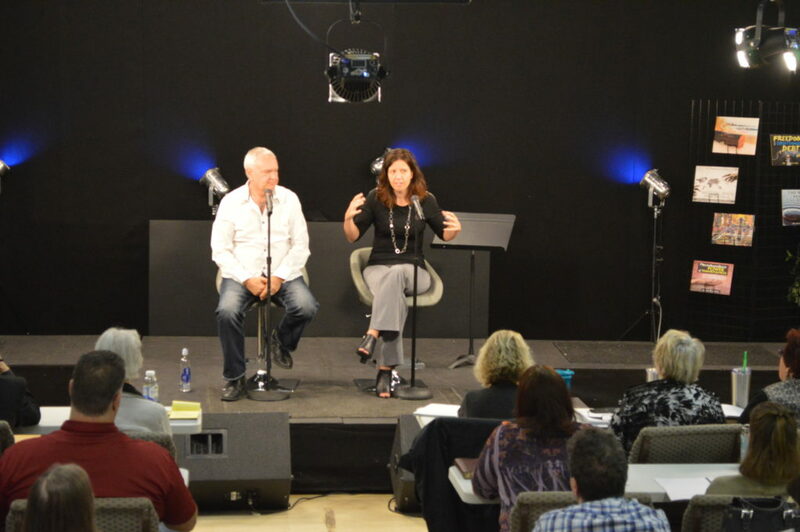 We spent the weekend sharing our experiences with EFT and if you weren't able to join us, you can still get the sessions here. Enjoy! EFT for Christians–Tapping Into God’s Peace and Joy, like Sherrie Rice Smith’s first book: EFT for Christians, is a wonderful book for those already practicing or new to EFT, Christian or non-Christian, or simply those wanting to tap into God’s peace and joy. Although I have been a practitioner, teacher, and author of EFT for nearly 20 years, I increased my knowledge, understanding, faith, and gratitude for this amazing God-given tool exponentially by reading this brilliant book! Charity and Sherrie expertly explain the process, science, physiology, psychology, and related faith-based principles that are the synergistic wholeness of EFT. The case examples and scriptural references are superb. This book will be helpful to Christians and non-Christians alike to gain a uniquely personal understanding of their internal and external world, and how they can more easily create God’s love, peace, and joy in their lives through EFT. As Christians, we strive for a closer relationship to God. Yet, many times this seems hopeless due to our sinful nature. In EFT for Christians–Tapping into God’s Peace and Joy, Sherrie Rice Smith and Charity Virkler Kayembe outline a plan of action to break through the junk from our past that holds us back from this goal. They use the God given technique of EFT (Emotional Freedom Techniques). This is a “must read” for Christians who want to advance in their faith walk, lead a more Godly life, and experience the peace of Christ. EFT works! I love this book! EFT for Christians–Tapping into God’s Peace and Joy held my attention from beginning to end. Sherrie Rice Smith writes with great passion, knowledge and experience. In this book she uses her spiritual perception to teach us that EFT is a tool of healing and “restoration to both the Church and to the dying world.” Sherrie’s books have been instrumental in helping me to understand and to integrate EFT into my Christian counseling practice. I have more than 20 years of experience as a Soul Physician, and EFT is an answer to my prayers. I thank God for using Sherrie to bring this message to the Christian world. Senior Pastor, River of Life Community Church in Elkhart, IN. As I began reading EFT for Christians–Tapping into God’s Peace and Joy, I realized this was new territory for me. Having been in Inner Healing and Deliverance Ministries for more than 20 years, I seldom come across something “new.” After reading a few chapters, I found myself cautiously intrigued by what I read. That’s when I knew the Lord ministered to me. One Corinthians 12:4–6 describes the multifaceted nature of the Holy Spirit, His gifts, and His ministries. I became excited and realized this should happen often—new revelation and new teachings on the dynamic nature of God’s Spirit. This book opened my heart to new avenues of healing. Great job, ladies! EFT for Christians–Tapping into God’s Peace and Joy is a “must have” for every Christian library. It uncovers and demonstrates in a practical, simplified way how to bring freedom to every soul that uses EFT. The book lays a foundation with science and testimonies—backed up by the Word of God. Within minutes of finishing this book, I was able to apply its teaching and get a breakthrough in an area that had always “triggered” anxiety in me. That “trigger” is now gone. Thank You, Jesus. And thank you, Charity and Sherrie, for sharing this knowledge and revelation with the rest of the world. EFT for Christians–Tapping into God’s Peace and Joy is a direct gift from the Holy Spirit. It is not only a clinical guidebook to EFT, delving into the science and physiology of our Created selves, but it also a spiritual guidebook leading us to wholeness and freedom. It guides us along the path of Restoration to the very core of who we were created to be, by the One who is our creator. Thank You, Charity and Sherrie, for the blessing of EFT for Christians–Tapping into God’s Peace and Joy. What a gift for my clients, family, friends and my own personal journey to wholeness! This book is a wonderful sequel to Sherrie Rice Smith’s first book. It provides strong science and solid technique with excellent case studies and supportive scripture. As a Christian therapist, I am looking forward to using this book to set the bar for standard of care in Christian EFT. I’m anticipating it will become a well used resource. As a pastor and coach, I have discovered various healing modalities the Holy Spirit uses for our healing. I have used EFT many times within my ministry and coaching practice to help bring about God’s peace and direction for those who are hurting. I am extremely pleased this book and the EFT discipline is now being made available to God’s people. Rev. Kymberley Clemons-Jones, MSEd, M.Div. For those of us already convinced of the effectiveness of EFT—its method, science, and healing power—this book provides a solid summary of what makes it one of the most remarkable pathways toward healing and wholeness today. For those of us who are Christian, EFT for Christians–Tapping into God’s Peace and Joy represents a bridge—a link—between a practice that is intrinsically spiritual with Christian theology, conviction and faith. Alongside EFT for Christians this important new book completes the one-stop reference library for Christians and EFT. Senior Pastor of Broadway Christian Church, Columbia, Missouri. and Liminal Reality and Transformational Power. We are only now beginning to appreciate these astute words from King David. Truly we are wondrously made. Science is beginning to reveal the wonder of God’s genius in the creation of the human body. Today enters a new chapter in this revelation. EFT (Emotional Freedom Techniques) uses the miracle of our creation, the wonder of our construction, to release tension, anxiety and worry. 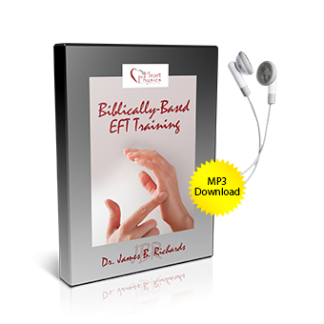 EFT for Christians–Tapping into God’s Peace and Joy will put a powerful tool into your own hands. You will no longer need to fear the shadows in the dark recesses of your mind, heart or past. The authors will lead you, in a non-threatening way, through a procedure that will allow you to very simply break free of anything that has ever tormented you. You can even wash away those unsettling emotions that are still lying in the pit of your stomach from your most recent meeting or phone call. Learn to survive life and to regain your peace and joy. You were meant to live in the peace of the Lord. God even empowered your physiology with the ability to release joy into every fiber of your being. EFT is a tool, and you will want EFT for Christians–Tapping into God’s Peace and Joy by Dr. Charity Kayembe and Sherrie Rice Smith in your toolbox. I am a neurosurgeon turned minister who has been given the opportunity to endorse Sherrie and Charity’s book on Emotional Freedom Techniques, EFT for Christians–Tapping into God’s Peace and Joy. Basically, Emotional Freedom Techniques releases blocked energy that has accumulated as the result of emotional stress. This includes trapped pain and ungodly beliefs also known as self-inflicted nonsense, which can be resolved. Emotional Freedom Techniques works because human beings have an energy system. EFT accesses this energy system in an amazing way and, therefore, should be in everyone’s first-aid kit. The more I study EFT, the more fascinated I become. Emotional Freedom Techniques is by far a most empowering tool because you can use it yourself and you can use it with others. And it’s always available to you once you get the rhythm of it and choose where you want to go. EFT for Christians–Tapping into God’s Peace and Joy is a phenomenal book written for your understanding and training. This book is for anyone who wants to learn EFT from highly experienced people. The more you read, the more you’ll learn, and the greater your response. Thanksgiving is a time to remember to be grateful. 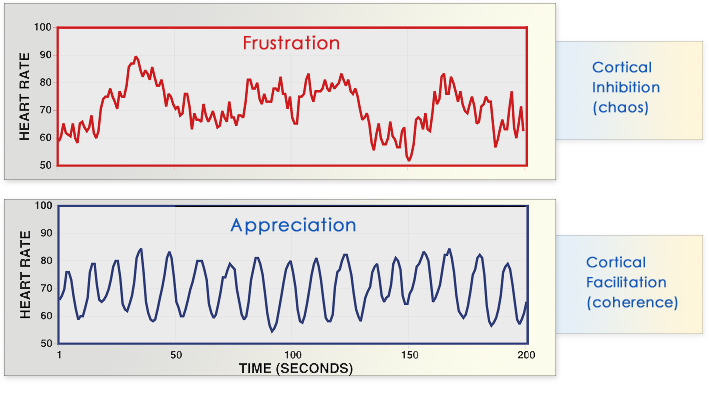 Take a look at the chart below and note the power of appreciation. Your heart rhythm becomes like smooth ocean waves. How much healing do you suppose that brings to your spirit, soul and body? Diagram from "Institute of HeartMath"
Journaling from Julia Parker as she goes through our Through the Bible training. A word that we all need to hear! A couple of weeks ago in a Prayers That Heal the Heart Seminar I was teaching on casting out demons and I instructed the folks that they were to set their hearts against the demon and hate it as we commanded it to come out. Well, I was asked the question, "Is it ever right to hate?" I assured them that the Bible described many things God hated and we pressed on. My recollection was of many Old Testament verses which stated God hated various things. So I decided to check for the word "hate" in the New Testamment, and here is what I found.